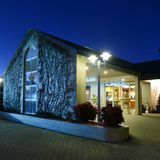 The Quality Hotel Powerhouse combines classic elegance with technology to keep you comfortable and connected while travelling. Each room, suite and apartment is modern, spacious, comfortable and non smoking, sound proofed for guest privacy, recently refurbished with luxury touches, elegant decor and furnishings. All offer air conditioning and heating, ceiling fans, comfortable bedding, wardrobe/ closet, alarm clock, radio, private marble en suite bathroom with shower, toilet, hair dryer and FREE MOR bathroom amenities, bathrobes, seating area with sofa, table and chairs, flat screen TV with satellite channels, FREE cable TV, ipod docking station, FREE WIFI , safety deposit box, desk, direct dial phone, kitchenette facilities with micowave, toaster, fridge and mini bar, coffee machine, tea/coffee making facilities, iron and ironing board. All towels and linen are provided. Recharge with the best breakfast in town. Stay overnight & enjoy a full continental buffet breakfast PLUS a delicious freshly cooked meal from our new seasonal menu â&#x20AC;&#x201C; our top picks are Smashed Avo or Eggs Benedict! Indulge in a North West foodie experience. Stay overnight & enjoy 2 Dobsonâ&#x20AC;&#x2122;s Distillery inspired cocktails, 2 course dinner (main & dessert) featuring local produce, daily gourmet breakfast, late checkout & Gourmet Traveller magazine. In 1888 Tamworth became the first town in Australia & the southern hemisphere to provide its residents with electric street lighting. The hotel was built on the old power station or â&#x20AC;&#x2DC;power houseâ&#x20AC;&#x2122; site, hence the name. The power station operated for 67 years, closing in 1955 when it could no longer meet the demands of the growing city. The obelisk at the front of the hotel was erected to celebrate the history of Tamworth as the First City of Lights. 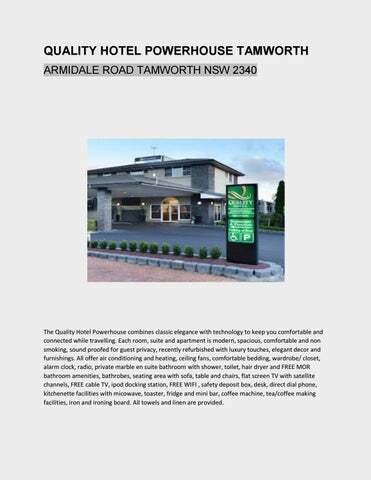 LOCATION 248 Armidale Road, Tamworth NSW 2340 The Quality Hotel Powerhouse is conveniently located on the New England Highway, just 2 minutes from the Tamworth CBD and 12kms from the airport. Tamworth is the major regional centre of the New England and is located midway between Sydney and Brisbane. Tamworth is proudly known as the Country Music Capital and National Equine Centre of Australia.